Bill Keane’s The Family Circus appears in over 1,300 newspapers and is ‘read’ by millions of Americans each day of the week. It began in 1960 and is still going strong. Considering the generally low quality of most syndicated strips these days, it’s a bit surprising to me how often this particular one panel cartoon comes up for ridicule/parody/rants/angry criticism. Yes, it’s bland and unfunny but so is Beetle Bailey, right? 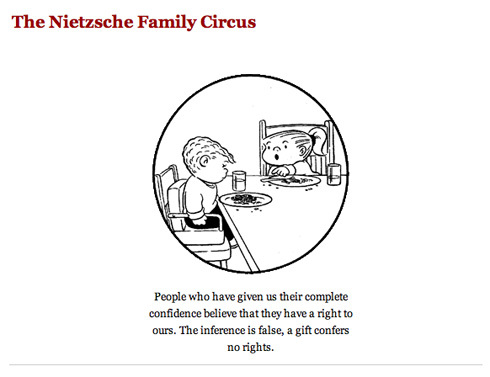 Anyway, here’s a truly twisted take that I have to imagine even its creator might appreciate: The Nietzche Family Circus which pairs a random quote from the philosopher with a random Family Circus panel, see example above. Now someone has to do the same thing with Batman and Robin and John Rechy’s City of Night. . .